Biomedicina Slovenica (BS) is the Slovenian national bibliographic database for the field of biomedical sciences. Since 1976 it has been built by the Institute of Biomedical Informatics of the Faculty of Medicine. BS covers the works published in Slovenia and the works of Slovenian authors published abroad which meet the quality standards and bibliographic criteria (see below). 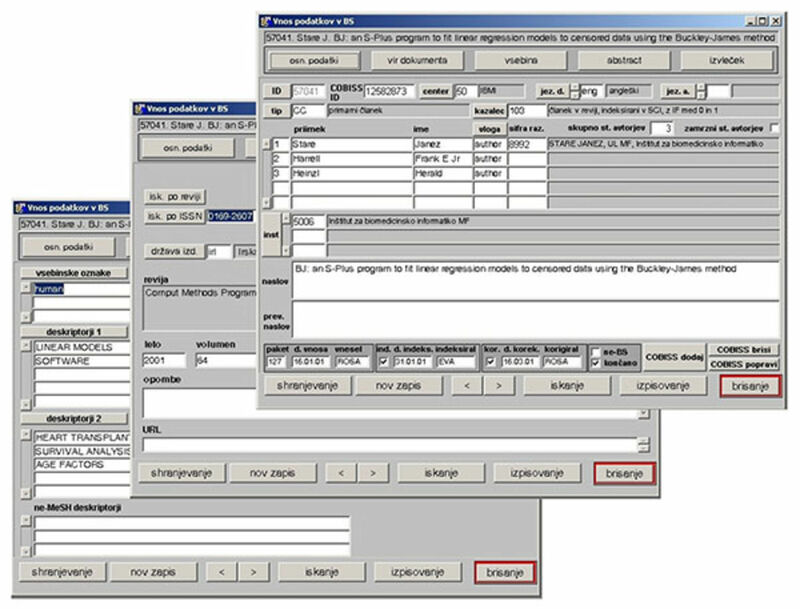 MEDLARS standards, which are used by the world-leading medical bibliographic database Medline, were applied in the design ob BS. Contents are processed usign descriptors in English from the hierarchically organised MeSH thesaurus (Medical Subject Headings). Each record contains primary descriptors (up to 5 of them) describing the central topics of the publication, and secondary descriptors (up to 12 of them) describing additional topics. The meaning of descriptors can be more precisely specified by qualifiers. When necessary, non-MeSH terms are added for concepts not included in the thesaurus. Particular value of BS is in its coverage of specific biomedical information not included in the major international databases, transfer of new findings into Slovenian medical practice and the possibility of producing bibliographies of individuals and institutions. In the recent years, BS is also being used as the basis for the system of evaluation of research in the field of biomedicine. Biomedicina Slovenica (BS) contains data on Slovenian scientific and technical documents from the field of biomedicine. Document selection is based on the following criteria: authorship, relevance for biomedicine and quality. Works by authors of Slovenian nationality and/or permanently residing/working in Slovenia are included in the database. The following documents are included regardless of authorship> articles published in journals, proceedings or books published in Slovenia, doctoral dissertations, MSc theses and equivalent theses defended and published at Slovenian universities. Without content-based selection, the following documents are included: doctoral dissertations and MSc theses of the Faculty of Medicine, Faculty of Veterinarian Medicine and School of Public Health of the University of Ljubljana; publications authored by staff of the Faculty of Medicine and public health institutions; articles in Slovenian biomedical journals; other articles published in Slovenia in the field of medicine, stomatology, veterinarian medicine and biology. The document types included in the BS are: monographs, proceedings, research reports, BSc/BA and diploma theses, MSc/MA theses, doctoral dissertations, journal articles, book chapters, proceedings papers, technical reports, obituaries and interviews. Abstracts are indexed if published in journals covered by the Science Citation Index (SCI) or in international proceedings from 1997 onwards. Because of lesser significance, various congress/conference reports, book reviews, minutes and similar miscellaneous documents are not included in BS. Since 1997, IBMI has been a full member of the COBISS system. As part of that, we are in charge of maintaining bibliographies of all the researchers from the field of biomedicine within the COBIB national bibliographic database.